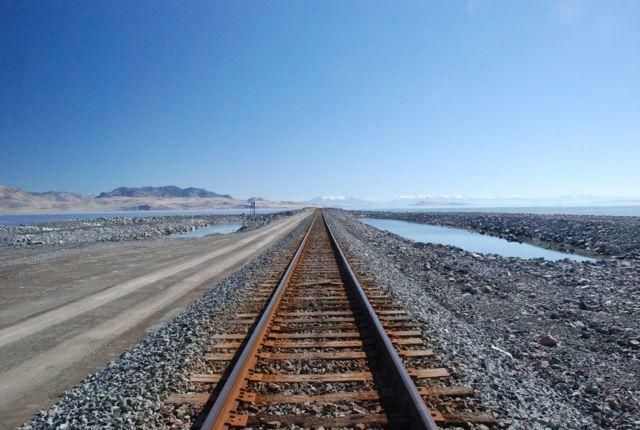 A railroad causeway cuts the Great Salt Lake into two separate bodies of water. Bill Johnson, a professor of Geology and Geo-Physics at the University of Utah, zips past an oncoming train on this narrow causeway crossing the Great Salt Lake. A green canoe is strapped to his Subaru, and four graduate students are packed along for the ride. They’re headed out to the middle the lake to test the waters. Built in 1959, this rock runway isolated the lake’s north arm known as Gunnison Bay that is saturated with salt and nine times saltier than the ocean. The water takes actually on a purplish hue. The main part of the lake, by comparison, is blue. It’s also salty but inflowing freshwater from the Jordan, Weber, and Bear Rivers keep it more hospitable for migrating birds, brine shrimp, and industries that harvest salt and other minerals from the water. A few years ago Union Pacific closed two crumbling culverts connecting the two sides of the causeway for safety. Despite the barrier though, Johnson says water still seeps into the south arm through the causeway creating a deep brine layer. The high concentration of methyl-mercury in the lake has worried many for years. It’s a neurotoxin, and it’s particularly dangerous for unborn infants and babies, but also adults if consumed in high doses. 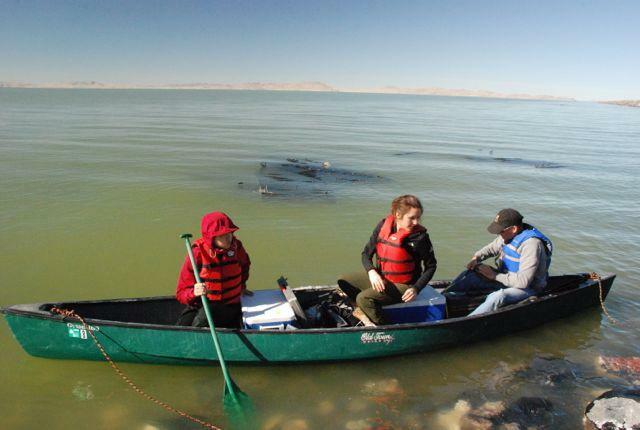 Professor Bill Johnson and some graduate students from the University of Utah head out to test the waters of the Great Salt Lake. Johnson says we don’t know enough yet about how methyl-mercury develops in the deep brine layer, to say that keeping the causeway closed would keep mercury out of the environment. He says it should be studied more. The state and the railroad company plan to build a new bridge in the causeway to manage flows and salinity levels in the next few years. But the lake’s extreme low levels are also complicating things for lake users. Mineral mining companies are extending their intake canals. Islands normally used by birds for nesting are no longer islands, making the birds vulnerable to predators. Moreover, Johnson says he and others who study toxins in the lake worry what could happen if the lakebed is exposed due to continued drought, climate change, or from damming the Bear River, as is proposed by state water managers.